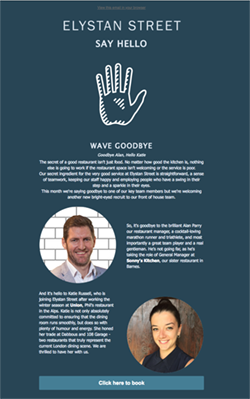 We design, write, send and analyse email newsletters. We can advise you on which email newsletter service will give you the best value for money, and set you up to send your own emails. Or we can provide a full service including design, copywriting and response analysis. Tell us about your target audience and we’ll come up with a plan which will work for you. 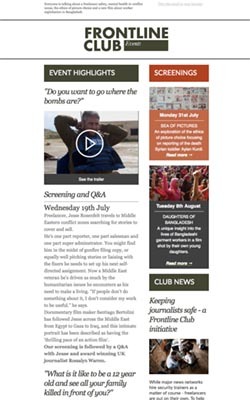 Just scroll down to see examples of some of the newsletters we have created. A hard hitting newsletter for this journalist club. 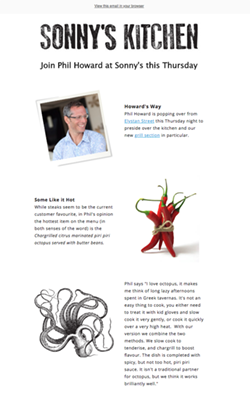 This email newsletter re-design raised open rates by 400%. Weekly promotional newsletter for a lively local restaurant. No matter how interesting or well designed your newsletter is, nobody will open it unless the subject line appeals to them. Crafting enticing subject lines is an art and because we write email newsletters on a regular basis we can advise you on what will work and what won’t. Once you’ve encouraged someone to click on your email you need to remember that you have just seconds to grab your customer’s attention. The design must be clean and clear and copy should be crisp and concise. Finally you need to adopt the right tone of voice which could range from authoritative to friendly and conversational, depending on your message and your audience. We can help you develop a house style with your emails and avoid the pitfalls that many of your competitors fall into – meaning that your emails will stand out from the crowd. You can opt for us to give you a template and some design and copy pointers or we can provide a full service, writing and designing your emails for you on a regular basis. We work with a number of different email newsletter providers, adapting their template designs to produce a structure that works for you and your customers. We also can produce bespoke coded template designs if off-the-peg templates don’t meet your needs.